I was recently able to experience KIEHL’S Apothecary Preparations, first hand. It’s personalized skincare and how often can that happen? Usually a skin care concern pops up and then you go find something to fix it. With the Kiehl’s way, you meet one-on-one in one of their stores with one of their trained experts where they evaluate your skin, access your needs and send you on your way with a product to address those needs. ‘Tis the season … to give back. This year KIEHL’S is donating 100% of the net profits of their Limited Edition Crème de Corps towards providing meals to families through Feeding America. Not 10% or 15% but 100%! Yeah, we love that. The holiday-art on the label is called “lumberjacks of fashion,” is Monty Python-esque (and of course the lumberjack reference helps! ), and was created by Jeffrey Costello and Robert Tagliapietra. Pick one up for $19.508oz, $48/16.9oz @ kiehls.com, dillards.com. Another BB Cream? This One Means Business! Now that every beauty line has a BB Cream in theirs, you just have to weed through the masses to pick out the best one for you. Up until now, this one has been it for me, but I think this is the next best one. It’s KIEHL’S BB Cream – Actively Correcting and Beautifying with SPF 50 ($37/1.35oz @ kiehls.com). Yup, SPF 50!! Love that as I don’t think you can overload on the sun protection these days. The formula is incredibly lightweight, buildable, and while they call it a BB, it acts more like a CC. With this one you get the coverage of a BB but also the correction like a CC. Got it? It seems that tinted moisturizers turn out to be too pinky for my tone from the addition of spf but the one I tried Fair/Medium doesn’t seem to be, phew. And like a lot of Kiehl’s products, this one comes without a lot of things: parabens, fragrance, silicone and mineral oil and is really great for those with sensitive skin as I’ve heard some of these packed-to-the-hilt super creams can be a little irritating. Available in 4 shades. A great value and way to try out these products is with the Ultra Facial Oil-Free Moisturizer Starter Kit for $29.50. It contains a 1oz Cleanser, 1.4oz Toner, and 4.2oz Lotion. Get this collection @ kiehls.com. I have a problem digesting milk so I stick to soy-based products. And what’s good for my insides has to be good for the outside. 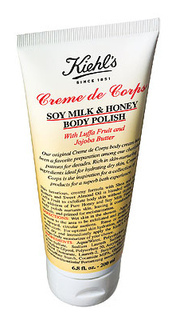 KIEHL’S new Crème de Corps Soy Milk & Honey Body Polish ($27.50/6.8oz @ macys.com) is simply dreamy. Soy milk AND honey? Yum! Medicinal Shea butter, jojoba butters and almond oil top off the skin benefiting ingredients and the exfoliators are ground luffa fruit (from exactly where you are thinking, the Loofah). Such a treat that I could eat.